Les Saisies apartment in the chalet Les Gold Medals. Privileged location on the alpine slopes and cross. Near the ski school. Unnecessary car during the stay. Leave your car in the car park to the cottage during your stay and do not touch it if you want because you will be close to all the services of the resort. Apartment very functional. The independent rooms help ensure a significant privacy after a full day skiing in this beautiful resort of Saisies. Generally satisfactory apartment although could do with some modernisation and thorough cleaning. The furnishings are rather tired. We only used the hob for cooking; the oven was dirty inside. Lots of hot water and a nice shower. We weren't there much of the time so perfectly adequate for two people. This is a typical french apartment. Small but comfortable. I would say best suited for only 4 people. There are two separate bedrooms and the living area is compact. The apartment has a ski locker in the basement and also free parking. The best feature of this apartment is the proximity to the slopes. With only a short walk of 100m you are next to the slope ready to ski down to the chair lift. The lady who handed the keys over did not speak English and I have very limited French which did cause a slight problem when I had to call to advise her of our arrival time. She was very friendly though. I would stay her again and I would recommend this apartment. Nous avons passé une semaine agréable dans un appartement bien conçu pour 2 adultes et 2 enfants. Situation idéale à proximité des cours ESF et des pistes. Un plus : le parking pour la voiture. 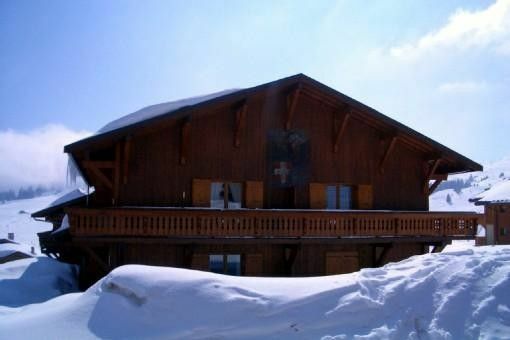 The appartment is on a good location near the ski area, city centre and skimming pool. We had a nice week! The contact with the owner is good and he is very helpfull. With, in the background, the Mont Blanc, the Col des Saisies Site is a special place in the Alps. In summer and winter landscapes are beautiful, the place is magical.